Hrm. So, last time I maaaay’ve been a tad… overconfident… in my abilities to persuade everyone of doing things my way. I thought I was done with Khenarthis Rest — war averted, shoulder armor equipped, day saved. Not so much, as it turns out. 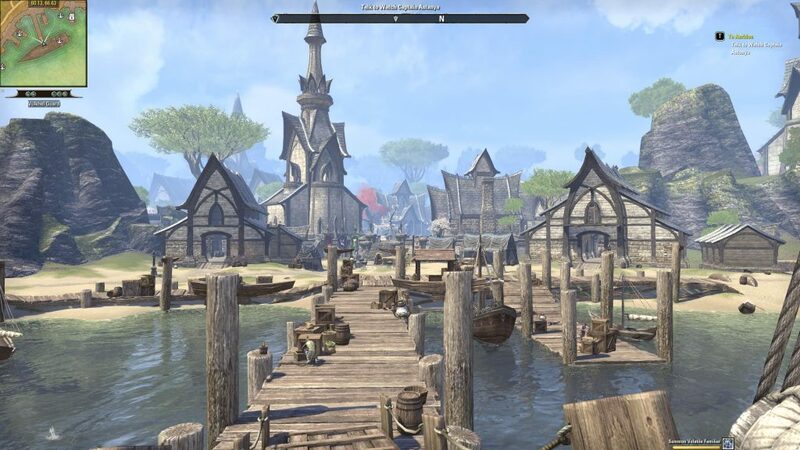 The Maormer (Sea Elves) were still very much in favour of attacking the port, in order to express their vast dissatisfaction with the Dominion coming in and laying any sort of claim to the area. Yelling ‘I come in peace!’ seemed to have little impact. Plan B: Kill the bad guys, steal their electricity. 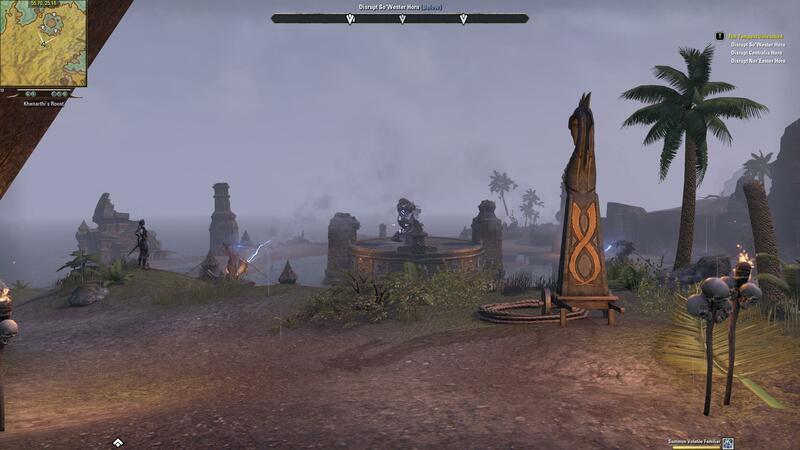 So after being tricked into experimenting with extremely high voltage lightning pillars armed with only a lodestone — and surviving, it was time to move to plan B. There was a small army inside this place, but I still managed to take away all their zappy-zap-power. Unfortunately, they did still have one trick up their sleeve. I get to summon a tiny goblin thing, and they get this?? The distance belies the scale. Luckily, the Maormer only had a very tenuous control over this titanic elemental beast. So once I disengaged their safeguards it was more interested in slaughtering its captors than anything else. Moral of the story: It’s not the size of your summon, it’s how you command it. I decided after releasing it though to make a quick exit. What could really go wrong with just leaving it be anyway? A trifling detail, one I saw no need to rain on the party with as my success against the Maormer was being celebrated in the ruins of town. 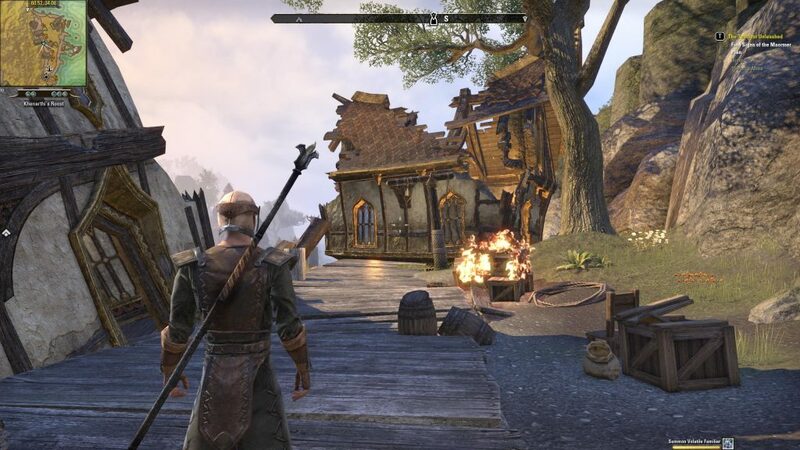 … In unrelated news, I’m off by boat to Vulkhel Guard in Auridon. Much better. Far less fire and destruction going on here. 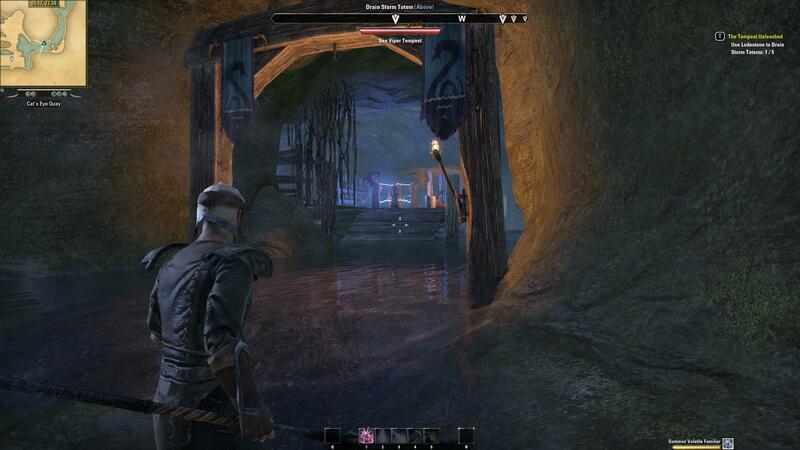 It was upon reaching Vulkhel Guard that I decided to reassert the original plan upon myself. Ignore all side content, work through only quests required for the main storyline. That’s. All. THAT’S. ALL. … Unless this happens. WHAT IS THIS? There’s a Stargate in my sky. It… appears to be trying to float away? I don’t know. I should go investigate. 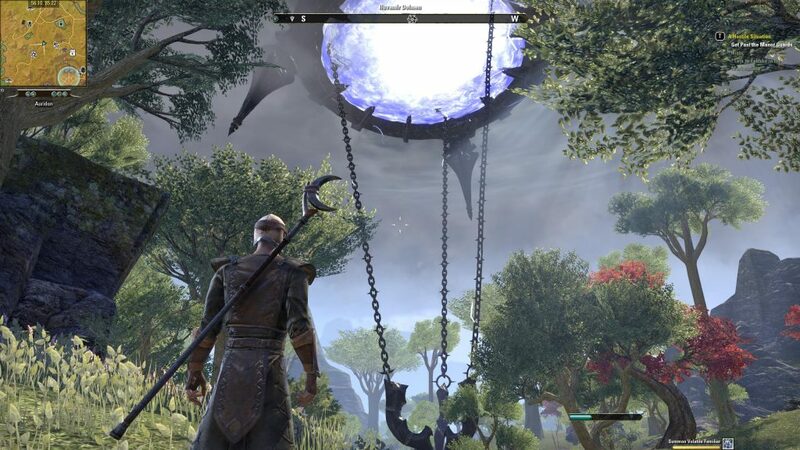 I fought against the G’ould Daedra coming out of the Stargate Dolmen alongside a number of other folk ranging in levels from 7 to 40-something. It reminded me a lot of rifts in, uh, Rift. 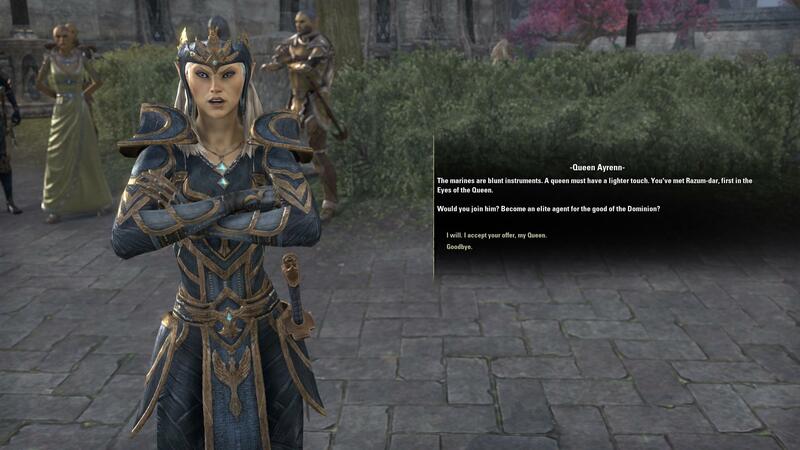 I returned in short order though and spoke to the Guard Captain like Raz had asked me to. I’ll spare some of the details here for those who may yet wish to go through it themselves, but I ended up saving the day again (properly, this time) and joining Queen Ayrenn’s secret service. This is essentially where I wrapped up the last two nights of play. I’m level 11, almost 12 and about to embark on a pilgrimage of sorts with the Queen it would seem. I really want to keep to the main path. I’ve been pretty good at steadfastly ignoring all the other quest pick-up markers on the map in Vulkhel Guard. But I know me. And after even just these few posts, you might have an inkling too. Once I leave town and see the compass map-markers in every-which-way around me…? All bets are off.